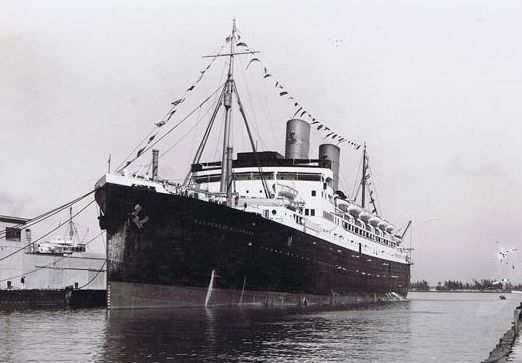 The 6,062-ton Canadian-flag Princess Patricia was the origin of the name of Princess Cruises. In the winters of 1965-66 and 1966-67, Canadian Pacific’s 347-berth Princess Patricia ran a number of Mexican Riviers cruises on charter to the newly-formed Princess Cruises, sailing from Los Angeles. To celebrate the line’s 50th anniversary later this year, Princess Cruises has scheduled the 680-berth Pacific Princess for a special Mexican Riviera itinerary departing Los Angeles on December 3, 2015. The Pacific Princess will sail fifty years to the day after the Princess Patricia departed on the line’s first cruise in 1965. The Princess Patricia normally operated her in Canadian Pacific’s Alaska cruise trade by summer and was laid her up in Victoria each winter. 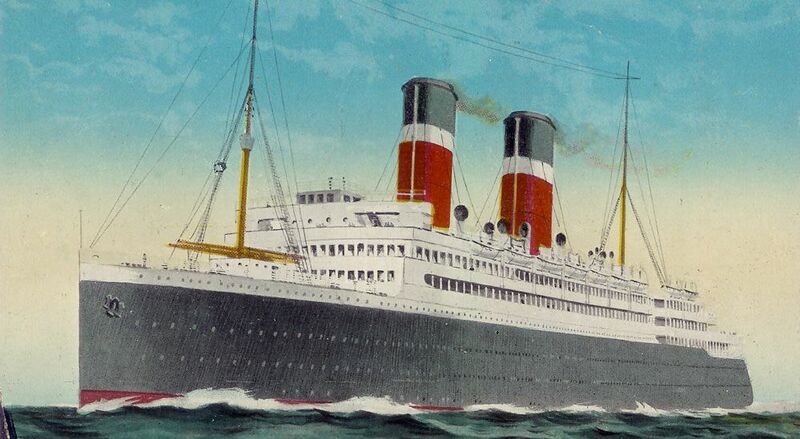 But the original use of the name Princess Cruises actually dated back to its colloquial use in Canadian Pacific Alasks brochures as early as the 1930s. The Pacific Princess, now the smallest ship in the Princess fleet, will operate a 14-night cruise of the same duration as that first cruise on Princess Patricia. It will include a blend of ports from the maiden itinerary, including Puerto Vallarta, Mazatlan and Manzanillo, and add some newer destinations such as La Paz and Loreto. Princess Patricia‘s success in this trade allowed Princess Cruises to move on to larger ships and to expand into the Alaska trade as well. The fledgling cruise line was then acquired by Britain’s P&O in 1974. The 50th anniversary cruise has been on sale with fares starting at $1,699 per person, double occupancy. 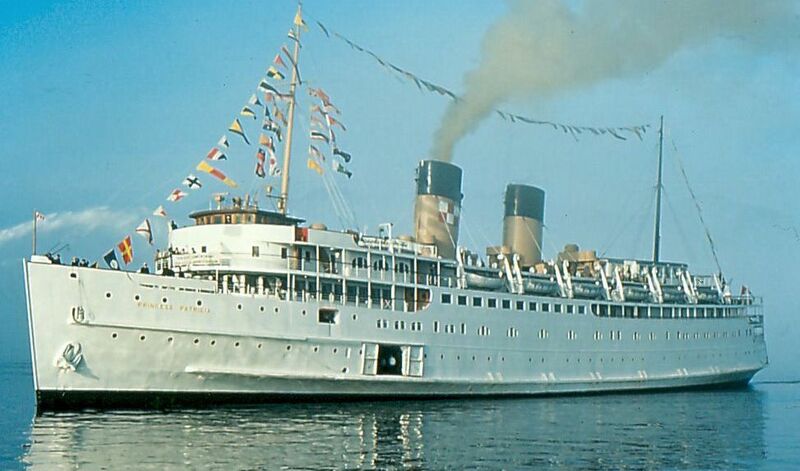 By way of comparison, fares on the 1965 Princess Patricia cruises began at $430. While that fare may seem high for 1965, they were less per day than her 8-night Alaska summer cruises, which started at $275. And taking into account inflation, $430 would be worth $3,204 today, meaning that in real terms the cost of a 14-night Mexican Riviera cruise has dropped by almost half in fifty years. Now one of the best-known names in cruising, Princess Cruises’ first season offered ten cruises to Mexico between December 3 and April 8 accommodating about 3,200 cruisers. Nearly fifty years later, Princess is the third largest cruise line in the world, with seventeen ships carrying 1.7 million cruisers to destinations worldwide. For bookings and details of these and any other special cruises please call The Cruise People Ltd in London on 020 7723 2450 or e-mail cruisepeopleltd@aol.com. In North America call 1-800-961-5536 or e-mail cruise@thecruisepeople.ca. Last week big news broke from both Royal Caribbean and Carnival Corp & plc. Royal Caribbean for its part will be sending its newbuilding “Quantum” class ship Ovation of the Seas to cruise from China next year, bringing the Royal Caribbean International fleet based in that country to five ships sailing from four ports. Meanwhile, for its part, Carnival Corp & plc has announced orders for nine new ships, five from Fincantieri and four from Meyer Werft. As yet, their distribution has not been announced but they are to be delivered between 2019 and 2022 and will be not only for European and North American brands, but also for China. Another company that once ordered nine ships at once was Canadian Pacific, in 1926. Carnival’s first two cruise ships were former Canadian Pacific “Empresses” and every Carnival Cruise Line ship since has had an “Empress” deck, while Princess Cruises took its name from Canadian Pacific’s coastal fleet of “Princesses” that used to cruise from Vancouver to Alaska. This cruise was unique, and the only one of its kind ever offered by Canadian Pacific. 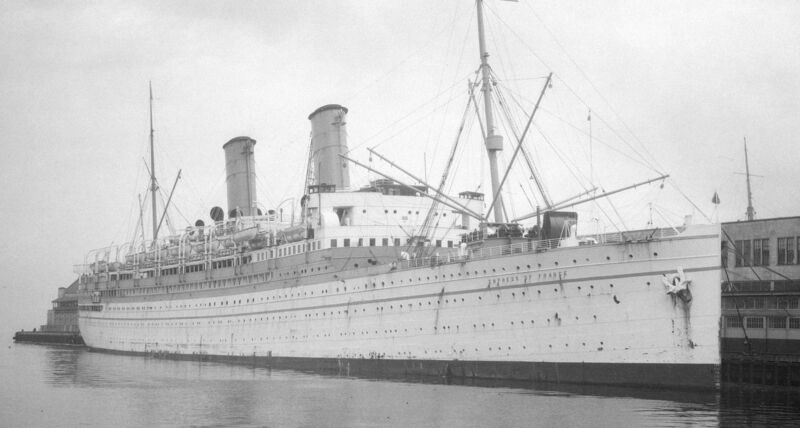 While the Duchess of Richmond had become the largest ship ever to call in Miami on a winter cruise in 1935, she was usually engaged on the North Atlantic in the summer time. The fact that it was 1939 and there were fears of impending war in Europe may have had something to do with it, but at the same time she visited both the World’s Fairs of the year. In New York, she stayed overnight on Wednesday, July 5, and in San Francisco, she spent two nights, from Saturday, August 12 until Monday, August 14. The Admiralty has taken over control of all British shipping, it was announced tonight. The control came into operation as from midnight last night. It means that all British ships must obey all Admiralty instructions, including changing course and destination while at sea. On arriving at Vera Cruz on Sunday, August 27, the Duchess of Richmond was instructed to black out and when she arrived that way in New York, she incurred a delay at the pilots’ station because she could not be seen. Cruises like this one rarely come around these days but P&O’s Oriana did a long one from Southampton a couple of years back, and occasionally it is possible to book a Trans-Panama cruise all the way from Montreal to Vancouver or vice versa. 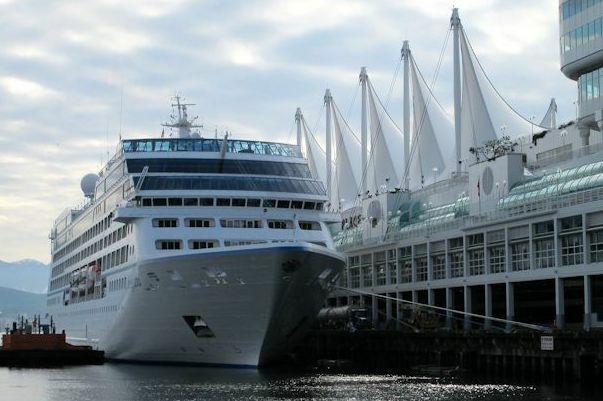 This year, for example, Oceania Cruises’ Regatta leaves Vancouver on August 19 for a 40-day cruise that takes her to Ketchikan, Juneau, Sitka, Victoria, Astoria, San Francisco, Cabo San Lucas, Acapulco, Huatulco, Chiapas, Puntarenas, Cartagena, Norfok, New York, Newport, Boston, Bar Harbor, Saint John, Halifax, Sydney, Corner Brook, Quebec and Monrtreal, where she arrives on September 28. Regent’s Seven Seas Navigator also leaves Vancouver, on August 20 in her case, for a 41-night cruise that takes her to Ketchikan, Skagway, Juneau, Sitka, Victoria, Astoria, San Francisco, Cabo San Lucas, Puerto Vallarta, Huatulco, Chiapas, Puntarenas, Cartagena, Grand Cayman, Fort Lauderdale, Port Canaveral, Norfolk and New York, Newport, Boston, Bar Harbor, Saint John, Halifax, Sydney, Saguenay, Quebec and Montreal, where she arrives on October 2. Both the Regatta and the Seven Seas Navigator will be offering similar cruises in 2015, leaving Vancouver on August 23 and 26, respectively, so you can plan well in advance. For further details of such opportunities please call The Cruise People Ltd in London on 020 7723 2450 or e-mail cruise@cruisepeople.co.uk or in North America on 1-800-961-5536 or e-mail cruise@thecruisepeople.ca. The Cruise Examiner for 14th July 2014..
Markets can go up as well as down is the frequent warning about the stock market and it appears that after years of non-stop growth the same is now true of the cruise market. While China and Australia boom and Germany and France grow, the UK is flat and markets in Brazil, Spain and even Italy are shrinking. As well as markets we have a look this week at the first episode of a new four-part ITV documentary based on life on board the new Royal Princess. 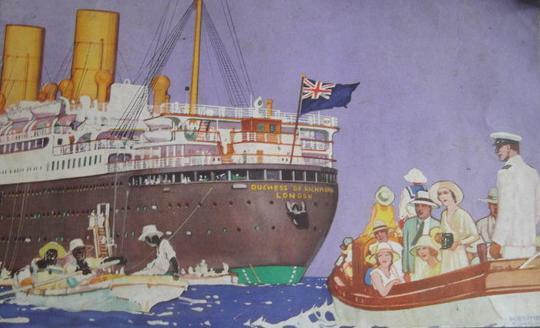 And finally, seventy-five years later, we look at the Duchess of Richmond’s summer cruise from Montreal and New York to California, Hawaii, Alaska, British Columbia and Mexico just before war breaks out in Europe. The Cruise Examiner for 30th June 2014..
Last week saw the float out at Marghera of the latest thing in ocean cruising. Viking Cruises’ Viking Star is a ship that is very traditional and yet is right up to date, with every stateroom having a balcony and all modern luxuries. We also look at Saga’s move back into outsourcing cruises from Azamara Club Cruises, Celebrity Cruises, Fred. Olsen Cruise Lines and MSC Cruises, something it has not done in a major way since the 1990s. 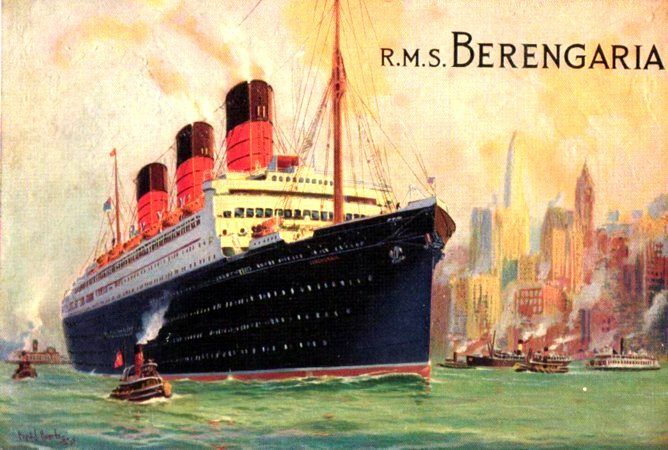 And we look back at passenger shipping a century ago, how the war delayed the building of fifteen liners, and how it would denude the Hamburg America Line of its six finest ships, from the Imperator to the Tirpitz. The Cruise Examiner for 5th May 2014..
Canadian Pacific’s 6,062-ton t.e.v. Princess Patricia performed Princess Cruises’ first cruise, from Los Angeles to the Mexican Riviera, on December 3, 1965. 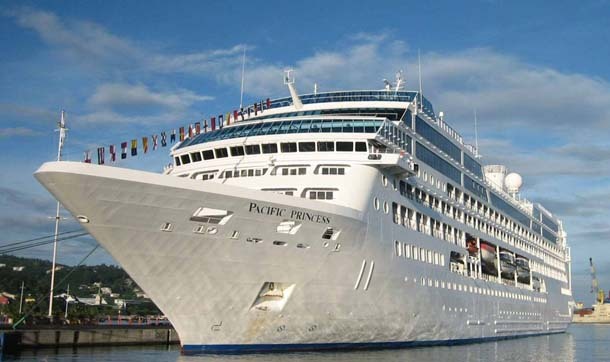 Princess Cruises’ 30,277-ton Pacific Princess will perform the line’s 50th Anniversary cruise, from Los Angeles to the Mexican Riviera, on December 3, 2015. Last week Princess Cruises announced that it was scheduling the Pacific Princess (above) for a 14-night 50th Anniversary cruise from Los Angeles to the Mexican Riviera on December 3, 2015, fifty years to the day after the chartered Princess Patricia (top) departed on her first voyage for the new line. In other news, last month Princess transferred its Japanese-built Diamond Princess and Sapphire Princess to UK flag, where along with three Australian-based P&O ships, they join a very small circle of five UK-flag ships in the Carnival fleet out of the thirty operated by Princess (17), P&O (10) and Cunard (3). Meanwhile, Adventure Canada will up its capacity by two-thirds next year with the charter of the larger Ocean Endeavour to replace Sea Adventurer in 2015.